Della makes 5 different kinds of rice. The company sent me a bag of each, along with a rice cooker, when I agreed to be part of their #CreateAStir campaign and I’ve been enjoying them all. Della’s rices are grown in Arkansas; They are non-GMO and, of course, gluten free. For the rice bowl you see here, I used their Jasmine rice with roasted garlic, but any of their Jasmine or Basmati rices would work (a short grain brown rice would be nice, as well). It’s really simple to prepare this rice bowl. 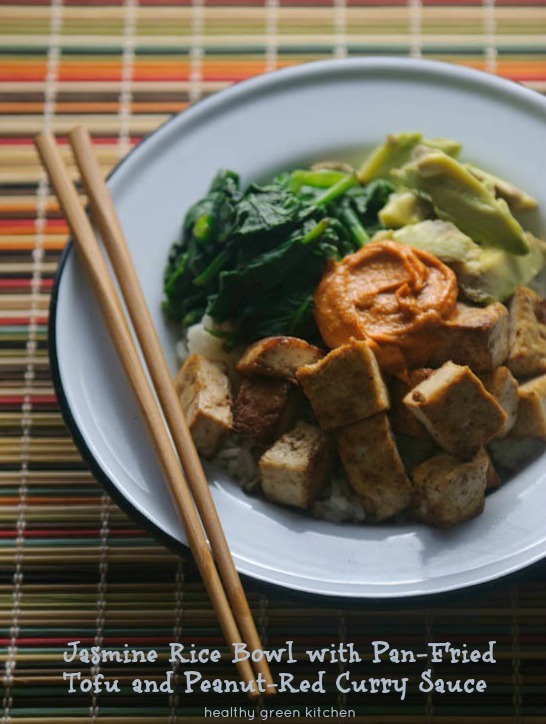 One your rice is cooked, spoon some into a bowl and top it with cubes of the tasty pan-fried tofu, some sliced avocado and boiled or steamed spinach (or another veggie of your choice). Finally: dollop some of the peanut-red curry sauce on top. 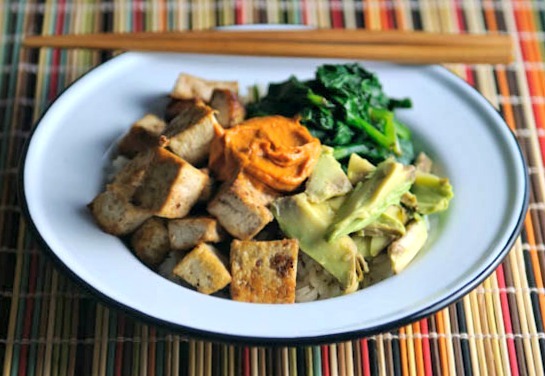 This stir/rice bowl is not just delicious but nutritious, too: it’s a very balanced meal and a great source of wholesome carbohydrates, protein, vitamins, minerals, and healthy fat. This is a quick and easy vegetarian meal you can vary to your heart's delight. Combine the Jasmine rice and the 2 cups of water and cook according to rice cooker's directions (or, if using a pot: combine water and rice and bring to a boil, then reduce heat to low, stir the rice, and cover the pot. Cook until all of the water is absorbed, about 20 minutes, then fluff and serve). 2. Heat the coconut oil in a cast-iron skillet. When it is hot, add the seasoned tofu cubes. Cook for several minutes, allowing the tofu cubes to brown on the bottom, then move the cubes around/turn them over so they brown on all sides. This should take 5 to 7 minutes in a hot pan. Add additional coconut oil and/or tamari or even a bit of water if the pan seems too dry. Remove skillet from heat and set aside. 3. In a medium pot, boil enough water to cover the raw spinach. When it is boiling, submerge the spinach and cook it just long enough for it to wilt fully but retain it's bright green color (no more than 1 minute). Drain the spinach and set aside. Slice the avocado. 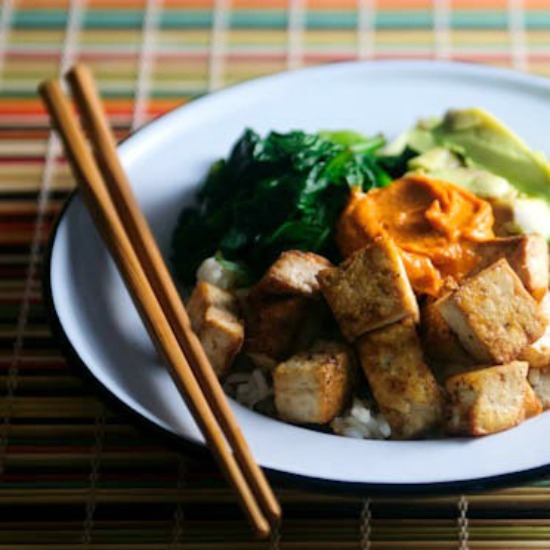 In a small bowl, combine the peanut butter, water, and red curry paste. Mix well until you have a smooth and thick sauce. Taste and add more peanut butter, water, or curry paste to taste. You may also add some fresh lime juice, if you like. By the way, Della is giving away 50 rice cookers! Winners are selected at random and the contest is open through April 10, 2015. Please use the Rafflecopter widger below to enter. Good luck! First off, let me say I love this blog! Everything I have made, has been easy and delicious. I got home pretty late tonight and thought I would give this recipe a try, as it seemed pretty quick! It was, but more than that it was so flavorful! I used quinoa instead of rice and added a sprinkle of red pepper flakes, but the obvious star of the dish was the tofu! I eat tofu fairly often as a vegan, but have never been able to make it taste as good as it did tonight! Thanks for the inspiration…you have saved me from a lifetime of regular OK tofu!! Fantastic friends. It’s look, just like lovely. thanks.